If you own an Instant Pot, you understand why it has become a favorite kitchen item for many people. This handy appliance makes mealtime quick and easy, and it can do everything from cook rice to bake a cheesecake. Instant Pot forums and websites have popped up across the internet, allowing fans to share recipes and tips and offer jubilant praise for the electric pressure cooker. One of the many wonderful features of the Instant Pot is that it keeps clean-up to a minimum because your entire meal is typically created in one, single pot. Many Instant Pot owners use their smartcooker often and rely on its simple recipes and quick cooking times for weekday dinners. The Instant Pot is relatively easy to clean, and it should be cleaned regularly and thoroughly to keep it sanitary and working properly. Basic clean-up of the interior pot, lid, and liner are a must after every use. An occasional deep-clean will ensure that your Instant Pot is kept in tip-top condition and that it will be around for a long time to come. Before cleaning, make sure to unplug your Instant Pot and remove the cord. While many of the cooker’s components are dishwasher safe, the main heating unit should never be submerged in water. You also need to completely dry all parts of the cooker before reassembling. The Instant Pot is an electric appliance, so always use caution when cleaning and don’t allow water to contact any of the electric elements. The removable Instant Pot liner is where the magic happens. This is the pot in which all food is cooked. The Instant Pot liner is made of food-grade stainless steel. It’s dishwasher safe, and you can hand-wash it with warm water and dish soap. Wash the liner after every use. Do not use any abrasive cleaners, steel wool, or other scrubbers or sponges that could scratch the surface of the liner. If you find that you have a particularly stubborn cleaning situation, such as burnt-on food, you can use Bar Keepers Friend Cleanser and a non-abrasive sponge or soft cloth to remove the debris. Regular washing of the liner after every use should keep it in good condition. You may notice that, over time, your liner is no longer shiny. This blueish discoloration occurs naturally in stainless steel and is caused by minerals or salts in the foods you cook. 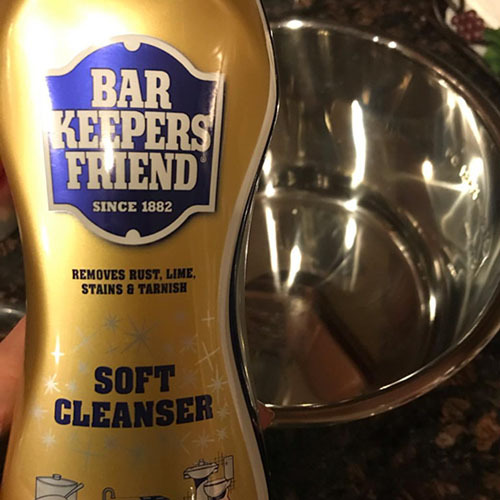 The simple solution for making the liner shiny again is Bar Keepers Friend Soft Cleanser. Simply squirt the cleanser into the liner and spread it across the surface with a soft, non-abrasive sponge. Rinse and towel dry, then admire the shine. The steam rack is the wire metal rack that sits inside of the liner and holds an additional pan or pot. A once-over with soap and water or a run-through in the dishwasher is all you need to clean the steam rack unless your cake runneth over and sticks to the rack. Use BKF Cleanser to scrub away baked-on messes. The Instant Pot lid has the most parts and pieces. It is here that oils, seasonings, and other foodstuffs can get caught inside of small valves and gaskets. Make sure to disassemble the lid and clean all components every time you use your Instant Pot. After detaching the lid components listed below, clean the lid thoroughly with warm, soapy water, or place it in the top rack of your dishwasher. Avoid using any abrasive soap or cleaning product that could scratch your lid. Once it is cleaned and rinsed, wipe it down to remove all moisture before replacing lid components and storing. The Instant Pot anti-block shield is located under the lid and covers the float valve from the inside. Just pop off the shield to remove it and wash it in soapy water. Rinse and dry, then set aside in a safe place (it’s small) until you’re ready to replace it. The Instant Pot’s sealing ring on the lid interior is what keeps the steam from escaping during cooking. This ring is made of high-quality, heat-resistant silicone, and you can wash it by hand in soapy water or place it on the top rack of the dishwasher for cleaning. Inspect the ring thoroughly for signs of wear and let it completely dry before replacing it in the lid. Also, make sure that the sealing ring is secure and snug before cooking again. Because the sealing ring is made of silicone, it can absorb food odors. The smells from spicy dishes, garlic, onions, and other foods can leave your sealing ring smelling pungent and affect the flavor of your meals. Clean it regularly to prevent odors. If you need to deodorize your sealing ring, simply soak it in water, mix in a cup of white vinegar, and let it sit for a few hours. Rinse and let it fully air-dry before securing it back into the lid. The makers of Instant Pot suggest using one sealing ring for savory foods and a separate sealing ring for sweet foods. They also recommend replacing the sealing ring every six to 12 months. Grease and food particles can clog these valves. Check and clean these after every use. The exterior of the Instant Pot is where the heating unit is located. It must always be clear of food debris. Never allow moisture inside of the heating unit and never run it under water or submerge it. After removing the liner for cleaning, a simple wipe down with a damp (not wet) cloth inside and out will keep it working well. Make sure to follow with a soft, dry cloth to remove all excess moisture and to prevent rust from forming. If you notice that water has gotten inside of your cooker, contact the manufacturer immediately. InstaPottin’ with Poonam is a great place to discover new recipes and learn about caring for your Instant Pot. She and her team created this informative video on how to clean your cooker from top to bottom. Follow InstaPottin’ with Poonam on YouTube, Instagram, and Facebook or search recipes on the website.